Trey Gowdy and his beloved Benghazi Committee used public funds to settle a defamation lawsuit filed by a former committee investigator, fired in part for refusing to target Hillary Clinton. The House Select Committee on Benghazi, led by Republican Trey Gowdy (SC), all but exploded in the wake of several stunning revelations in late 2015. The CIA revealed in October 2015 that Trey Gowdy altered documents in an attempt to frame Hillary; and in November 2015, Maj. Bradley Podliska, a former investigator on the Benghazi committee staff, filed a lawsuit against Gowdy seeking damages for defamation. Fast-forwarding to Friday 01 December 2017, The Washington Post reported that “Gowdy used $150,000 in taxpayer dollars to settle” that lawsuit. Podliska’s lawyer, Peter Romer-Friedman, declined to answer questions regarding his client’s settlement details citing confidentiality agreements. However, he did confirm to The Washington Post his belief that there had not been any other lawsuits regarding veteran status discrimination and retaliation the last five years. “I can confirm that my client is one person who brought a veterans status discrimination and retaliation suit against Congress and that the case settled on terms that were satisfactory to my client,” Romer-Friedman told The Washington Post. Gowdy declined to make any comment as well. 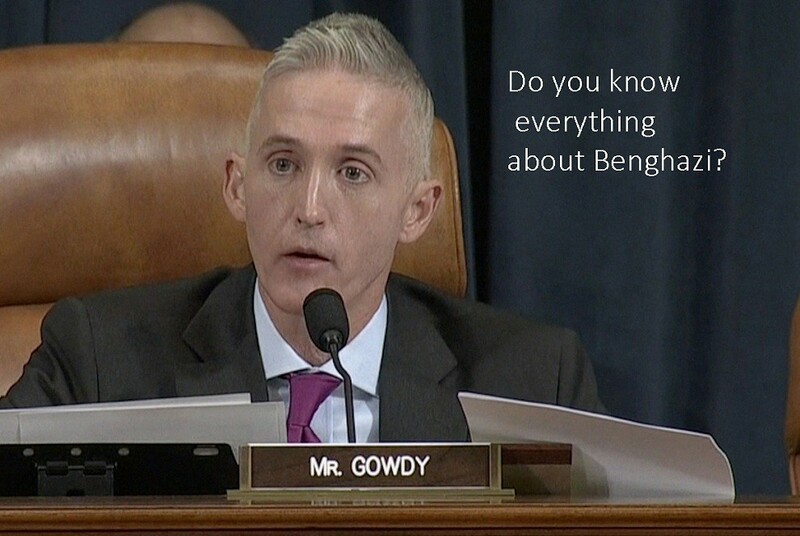 “The Benghazi Committee no longer exists. I would refer you to House Employment Counsel,” Gowdy’s spokeswoman Amanda Gonzalez wrote in an email. This is just the latest bombshell regarding Gowdy’s Benghazi committee, which has been plagued with allegations of crimes and multiple lawsuits for defamation… The time has come to hold Trey Gowdy accountable. In June 2016, Democrats serving on the House Benghazi Select Committee issued a 339 page report clearing former Secretary of State Hillary Clinton of any responsibility for security lapses during the Sept. 11, 2012 attack on the U.S. consulate in Benghazi that left four Americans dead, including Ambassador Christopher Stevens. The Democratic report also documented the grave abuses Republicans engaged in during this investigation—from A to Z. Republicans excluded Democrats from interviews, concealed exculpatory evidence, withheld interview transcripts, leaked inaccurate information, issued unilateral subpoenas, sent armed Marshals to the home of a cooperative witness, and even conducted political fundraising by exploiting the deaths of four Americans. Gowdy’s uncompromising Benghazi investigation witch hunt is illegal, unlawful, and demands accountability – hopefully in the form of a lengthy prison term. The Committee was given an unlimited, taxpayer-funded budget, spending more than $4.6 million in one of the longest and least productive investigations in congressional history—focused on Clinton. The Committee was being used by Republican fundraisers to attack Clinton. Gowdy’s name, image, and position were used to solicit political donations by Stop Hillary PAC, which describes itself as “created for one reason only—to ensure Hillary Clinton never becomes President of the United States. Gowdy didn’t release his findings until “just months before the 2016 presidential election” – seemingly to maximize potential damage to Clinton’s campaign. As Liberals Unite reported in October 2, 2015: in a bombshell revelation, the Central Intelligence Agency reached out to Democrats serving on the Select Committee on Benghazi on Saturday to confirm that Chairman Trey Gowdy had altered documents provided to the committee by Hillary Clinton. On October 7, 2015, Gowdy sent a response to ranking Benghazi committee member Rep. Elijah Cummings (D-MD), referring extensively to Sidney Blumenthal, a long-time confidante and adviser to the Clintons, who served as assistant and senior adviser to Bill Clinton from August 1997 until January 2001.